Warm, moist soil, well-enriched with organic matter. When growing dwarf lemons in containers, avoid potting soils that contain wetting agents. No. Grow at temperatures above 7°C (45°F). ‘Meyer’ lemons can survive modest freezes. In spring and summer, feed with a high nitrogen organic fertilizer. Fertilize more if you see yellowing leaves. Dill, Thyme, Marigold, Borage, Cosmos, Calendula and Peas. Lemons and other citrus are heavy feeders that resent close company. Set out new plants in late winter or early spring. Grow in containers of rich compost to keep plants compact and to make it easy to bring plants indoors for the winter. Good drainage is essential. Prune in spring or summer to shape plants, and watch for thorns. 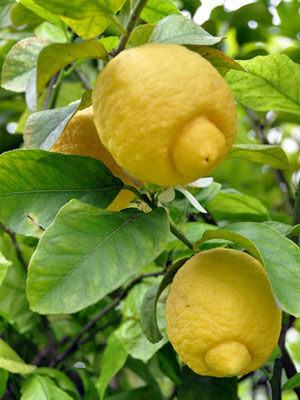 The 'Meyer' lemon is easier to grow than other types. Grow outdoors in the warmer months to expose plants to heat and pollinators. Soft soap sprays can help against scale insects and mealybugs.